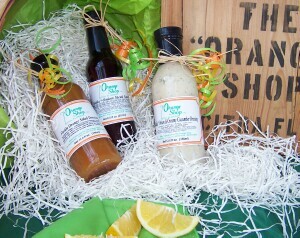 Brewed up with our secret recipes, these sauces and dressings are a perennial hit in our store. Not real hot or exotic -- just good, homestyle flavors. Great gifts from The Orange Shop during the summertime when we're not shipping fruit. 3 bottles in gift box -- choose any three flavors. All of these are great-tasting products. The Florida Orange Chipotle Sauce is the perennial top seller, followed by the Vidalia Onion Dressings -- but you can't go wrong with any of them!